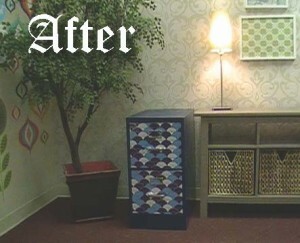 Paint a Filing Cabinet Fabulous & Finish it With WallPops! – PopTalk! Do you have a frumpy old filing cabinet at home? Most of us need our filing cabinets for extra storage and to keep our documents organized. However, they do not always make for an appealing room accent. 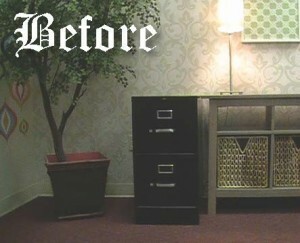 Have you thought about painting a filing cabinet, or, better yet, using wall decals to spruce it up? We have! Check out this quick video where we totally renovate a filing cabinet from drab to fab using a nautical blue spray paint and WallPops by Jonathan Adler stripes! Thinking about giving your home office decor a face-lift? Or, looking to put your filing cabinet to new use? Not just for organizing paperwork, those ubiquitous metal filing cabinets that seem to lurk in everybody’s home can be fantastic storage for everything from art supplies and photos to holiday decorations and even shoes. However, there is no reason to settle for the industrial-blah look of a typical file cabinet! Paint a cabinet and sass it up with WallPops! This DIY finling cabinet project was simple and came out gorgeous! We used the WallPops by Jonathan Adler Carnaby Stripes and a nautical blue spray paint. The total cost of this project was under $30!